Urinary tract infections. UTIs are very common in the elderly, and often display differently than in younger patients, through delirium, confusion, agitation, or even hallucinations. A simple course of antibiotics, fluids, and rest can completely reverse these symptoms. Thyroid disease. Thyroid-related symptoms can include forgetfulness, anxiety, depression, and lethargy—and it’s estimated that as many as 15 million adults (most over age 50) are currently undiagnosed. A blood test and medications may be all that are needed. Vitamin deficiency. In particular, insufficient levels of vitamin B-12 can result in confusion, irritability, forgetfulness, and other symptoms that imitate dementia. Sometimes in aging, the body becomes unable to absorb B-12, resulting in a condition known as pernicious anemia. The problem is often correctable through monthly injections or oral supplements. Alcohol abuse. According to Majid Fotuhi, founder of NeurExpand Brain Center, “Alcohol abuse, even binge drinking for a short time when you’re young, destroys brain cells in areas critical for memory, thinking, decision making and balance,” and can lead to a chronic memory disorder later in life. This condition can sometimes be reversed, however, through thiamine replacement therapy. Explore more dementia-mimicking conditions and their treatment options from AARP. Are We Medically Over-Treating Seniors? Take a peek into the calendars of many older adults, and you’re likely to find them inundated with scheduled doctors’ appointments, therapy sessions, reminders to refill and pick up medications, reminders to schedule MORE doctors’ appointments…you get the picture. Many feel however, that our focus as a society has been far too often on medical interventions, and far too infrequently on the type of care needed to improve quality of life. 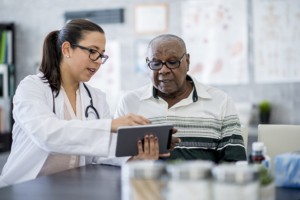 With as many as 12 million Americans requiring assistance with activities of daily living, one of our goals as advocates for older adults is to help educate those in the medical realm on the benefits professional home care can provide. Better communications between doctors, seniors and their families is essential to ensure that quality of life is not being sacrificed in favor of aggressive medical procedures, but instead, that appropriate care is provided according to the patient’s wishes and goals. Read more of Gleckman’s perspective on seniors and medical treatment. Debbie Savage, RN, BSN, President https://www.responsive-homecare.com/wp-content/uploads/2019/03/rhc-logo.png Debbie Savage, RN, BSN, President2016-01-15 18:06:092016-01-15 18:06:09Are We Medically Over-Treating Seniors? It’s certainly no surprise that the aging population is exploding, and poised to increase exponentially over the next few decades. The statistics are staggering: 900 million adults age 60 and older currently worldwide, and expected to rise to 2 billion in the next 20-30 years. Developed countries will be hit the hardest by aging challenges. Actually, according to Dr. Linda P. Fried, geriatrician and dean of the Columbia Mailman School of Public Health, China’s population of elderly is about to surpass that of the U.S. It’s anticipated that by 2050, third-world countries will have shifted from a population of mostly younger residents to an equal number of young and old. Cities are for the young. While cities have a long way to go in improving accessibility and age-friendliness issues, urban populations are steadily aging—by one estimate, up to 16 times more elderly in cities worldwide by 2050. The World Health Organization is taking steps to make life easier for seniors in cities through its Global Network of Age-Friendly Cities and Communities project—such as reinstalling bus stop benches that had previously been removed in New York City. Chronic diseases of aging impact the wealthiest nations. Surprisingly, it’s the less developed countries that are battling the most cases of diabetes and heart disease, along with diseases related to smoking and alcohol; and, the vast majority (88%) of health conditions related to environmental issues. Families value the elderly in other cultures, so care is superior. In both Africa and India, for example, there’s an assumption that elders are revered and cared for by family members; but sadly, as many as one in five Nigerian elders require care from family, but are not receiving it. And, because of limited resources, family care that is available is “severely compromised,” according to Isabella Aboderin of the African Population and Health Research Center in Nairobi, Kenya. Clearly, the effects of aging are reverberating around the globe, and thankfully, professional home care agencies, like Responsive Home Health, are positioned to provide the quality care and solutions needed for seniors today and into the future.